He autographed it for Henrik. 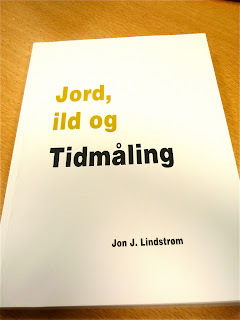 We are going to add it to the school library. A minerva movement in the back. 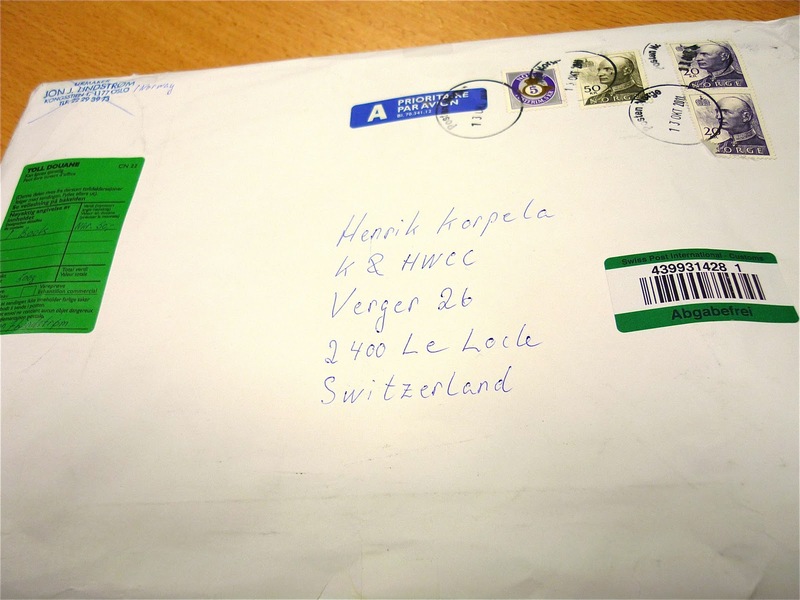 It was 10am this sunny Monday morning when one of our students was handed a box from the postman. It was a simple and unsuspecting box, but it had Zenith printed on a label somewhere. 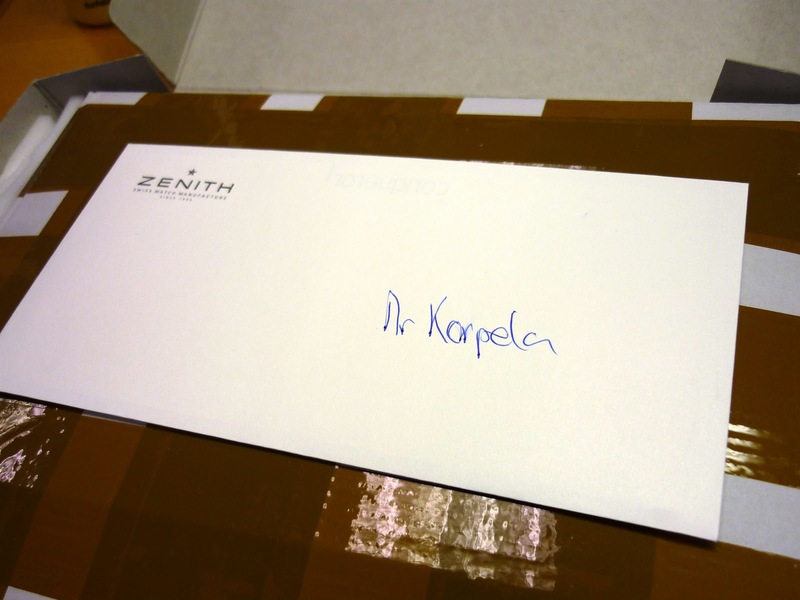 And woah woah woah, it was exactly what Mr Jean Frederic Dufour's representative from Zenith had promised, an El Primo movement would be delivered to the school this week. 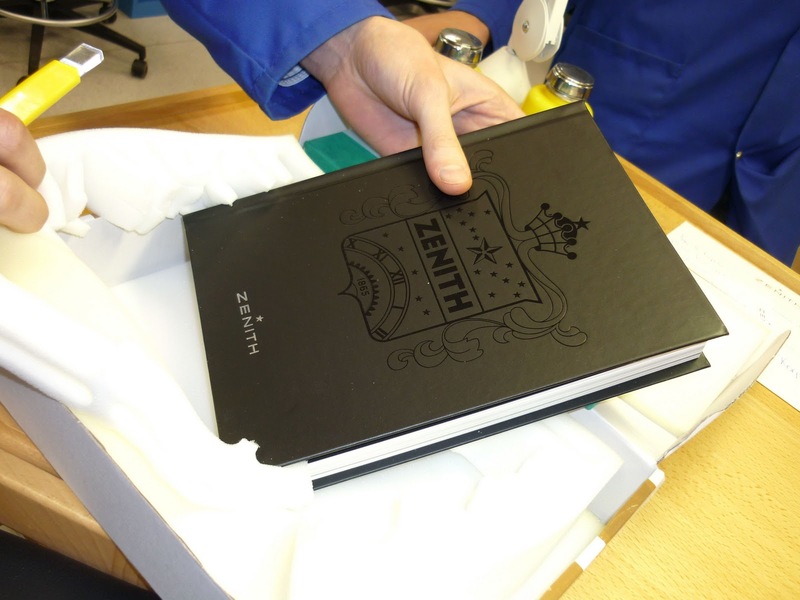 I think the pictures will tell the story better than words .. but we have one thing to say about Zenith. 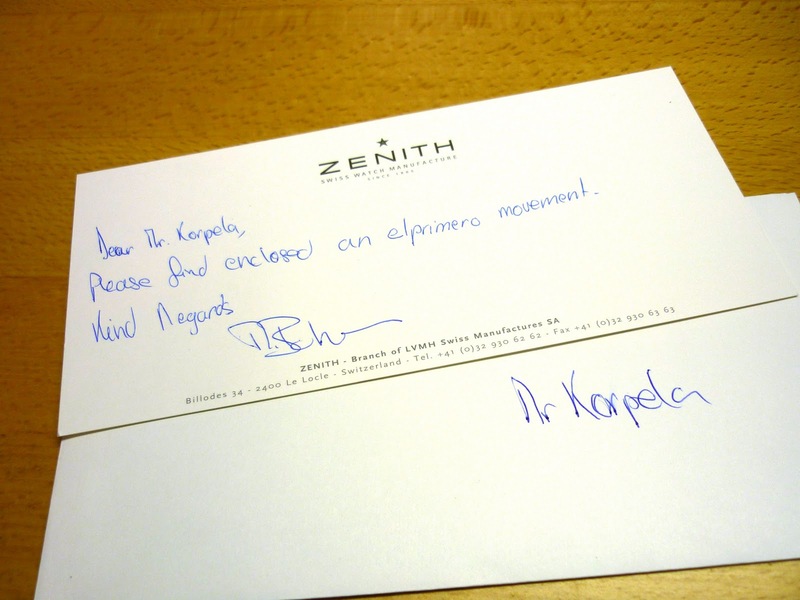 A handwritten note from Mr Dufour's Executive Assistant. It was such an awesome and nice gesture. It wasn't some computer generated note ! 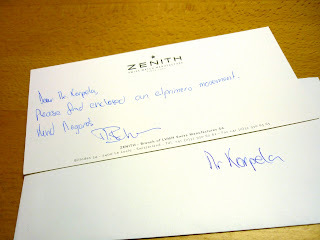 It was handwritten ! 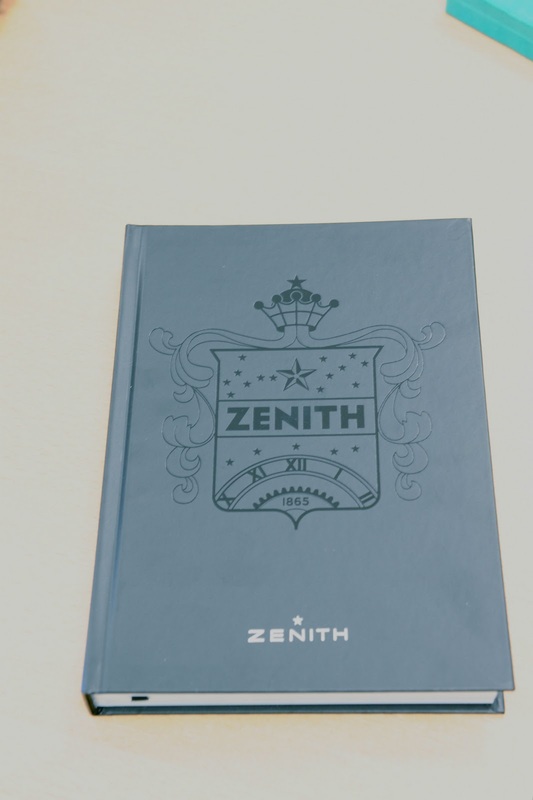 That is taking things to a very personal level and its very encouraging to see that big brands like Zenith being concerned and supportive of watchmaking education. To that, Zenith is truly a respectable watchmaking company that cares about the future of watchmaking. They included a very nice hard cover bound book which showcases their products and movements. Its totally awesome to see it in real life. 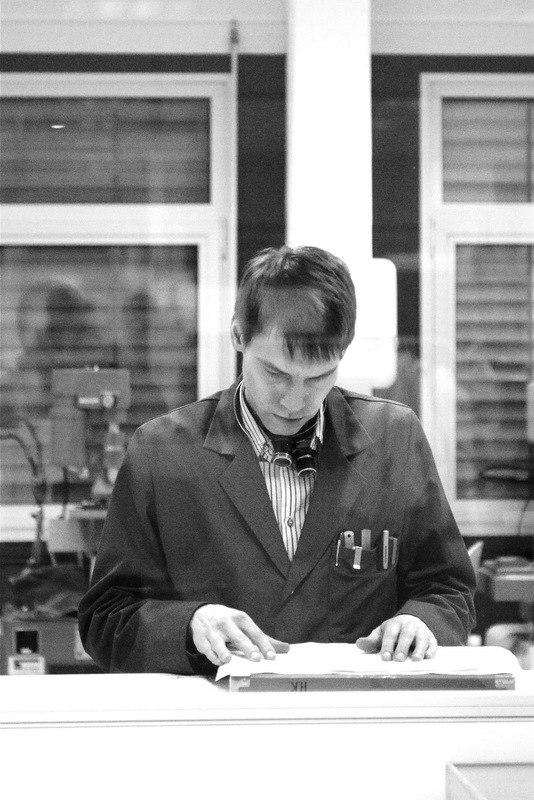 Henrik opening the box containing the El Primero carefully. CAREFULLY. The movement was nicely and securely wrapped ... Attention to details truly .. Tally ho ! Behold ! The El Primero ! Its a beautiful movement with a very nice Zenith rotor. 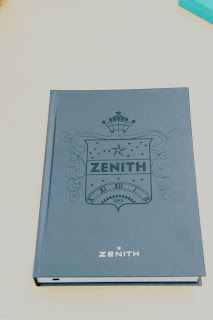 This is a better picture of the Zenith book. Look at the movement again ! AWESOME ! Visit to Mr Dufour. Part 2. It has been a phenomenal week that this has been. Again. We’ve had about 3 fullskill applications in 1 week and the applicants were all very passionate individuals. Looks like the future of classical watchmaking isn’t too dim right now. Anyway, for the final part on our visit to Mr Dufour, we are going to let the students and Instructors have their say. 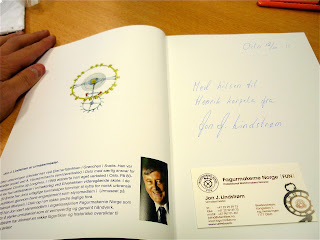 It was a wonderful visit and it was very inspirational. 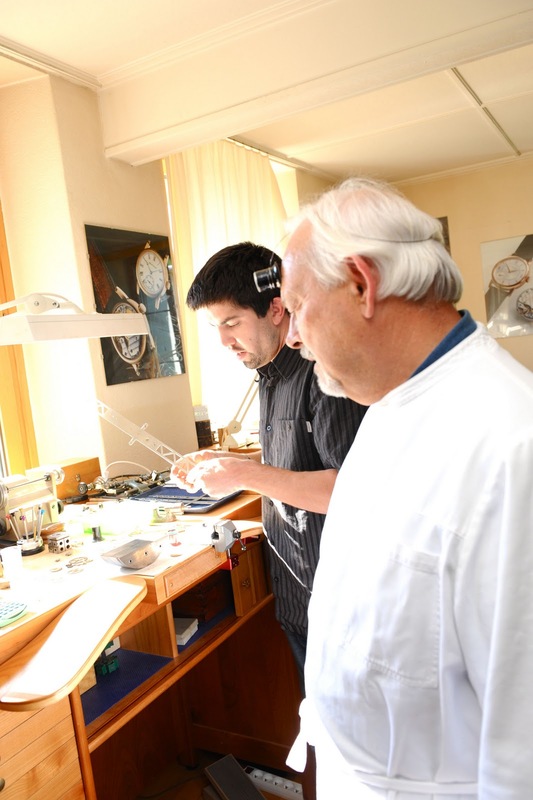 Mr Dufour shares my philosophy on classical watchmaking and education. 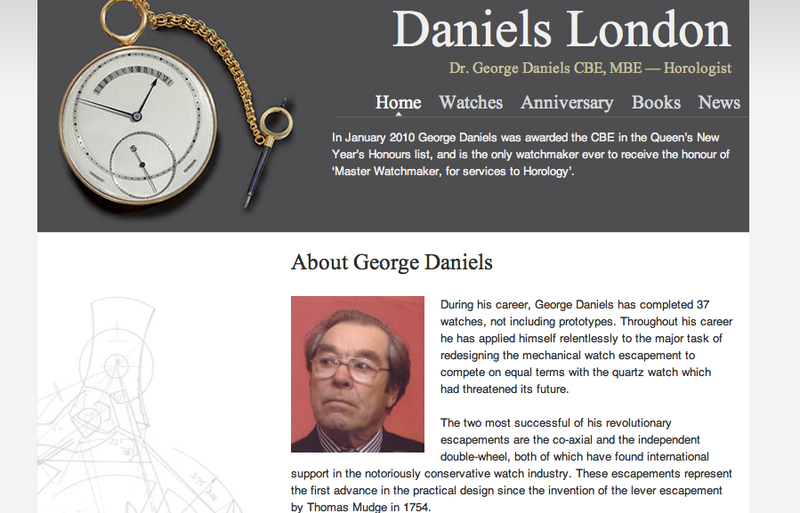 I was very honored and humbled that his thoughts and feelings on watchmaking were greatly similar. 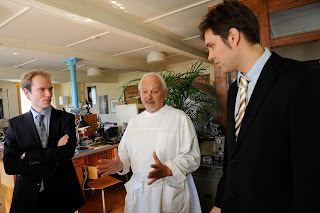 During the visit, and I personally feel that watchmaking education does not stop when I leave school, Mr Dufour was very kind to impart some of his treasured knowledge. He shared with me his knowledge in polishing jewel recesses with ebony wood and his use of diamond paste with a bow which produced finishings that were better than modern methods. 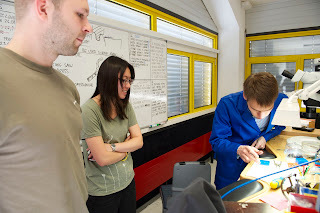 One major technical knowledge which I took away from the visit was the technique behind the production of the highest grade of handmade Geneva stripes. He also taught me how to source for the correct wood from the Swiss mountains so that I am able to do the polishing of bevels. I was also in agreement with Mr Dufour’s view on the decline of Swiss watchmakers who have lost interest in traditional swiss watchmaking. Overall, I wish I had more time there ! There was so much Mr Dufour was sharing and so much I can learn myself. Firstly, the visit was very educational. However, what I brought home was that Mr Dufour really drilled into me the whole idea behind quality and the philosophy of what handmade watches really are. 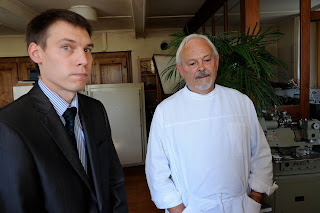 I was very thrilled and excited to see him, and I must say, Mr Dufour comes across as a very very nice man. I was totally blown over by the sheer level of quality in his timepieces. At the end of the day, I learned that I should always aim for the best, always improve your skills and to persevere. BUT, as he so rightly emphasized, it is not easy being an Independent and that is the REAL DEAL. Its amazing how important attention to details is. 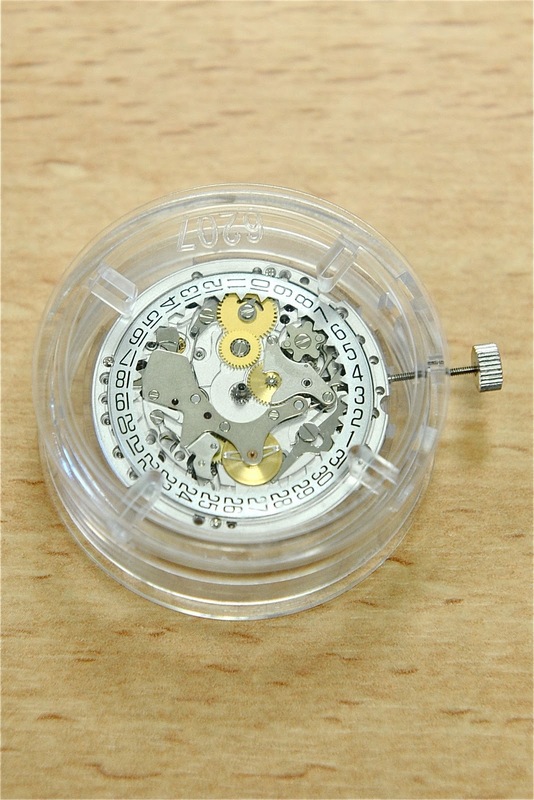 More amazingly, a simple watch can be beautiful if everything is done to a high quality by hand. 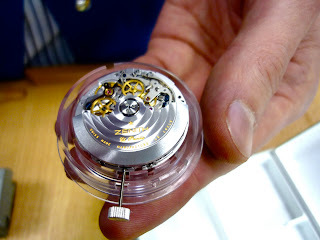 I learned how to work on a screw on this visit, but most importantly, I learnt that simple watchmaking is in reality 1000x more complicated than we think it is. On this visit, I learned how to use wooden tools like the stick and wheel to do polishing. Mr Dufour taught us to always ensure that the surface is super-flat before making stripes and that we should be using wood to achieve that. This process is unlike milling. 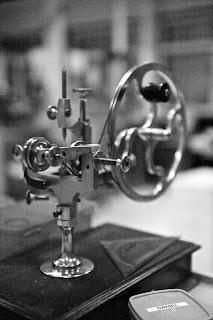 One watchmaking philosophy which I took away from this visit was that small dials and cases were more than reasonable for most movements. However, I think that one thing which really brought it home for me was that he emphasized to us that we should be prepared to spend the rest of our lives to do watchmaking and to forgo holidays. 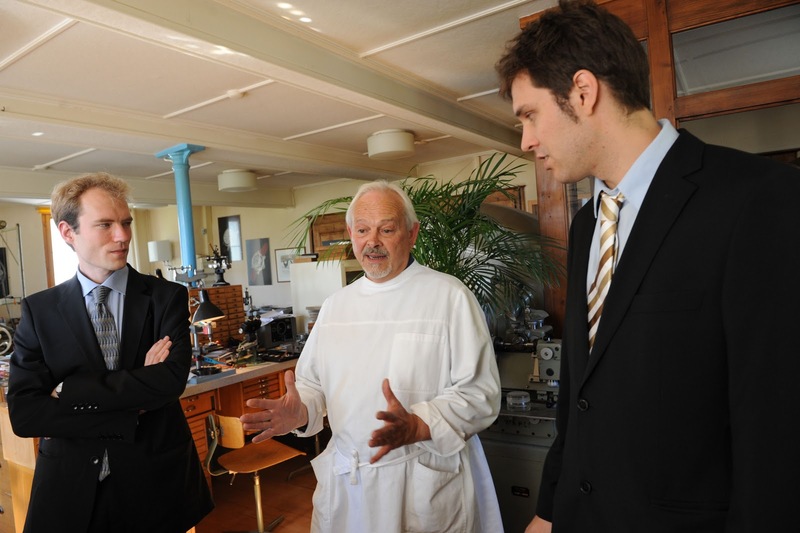 That was the testimony to the resounding dedication and passion which Mr Dufour has for watchmaking. First thing, I gleaned from Mr Dufour was the priviledge it is to have a handmade watch – the things that only humans can do that makes the craftsmanship truly exceptional. I was also encouraged by the similarities between Mr Dufour’s youth ( school-wise ) and my own. It made me feel that I’m really doing the right thing for myself and that I have a good chance to succeed. 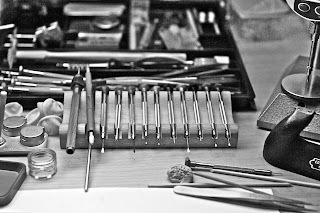 Finally, I realized the devotion needed to refine one’s craft to his level – how ironically, yet maybe poetically, the master watchmaker shouldn’t count time. We left the workshop at about 5pm and we only expected to be there for about 1 -2 hours but Mr Dufour was so kind. We were there for more than 3 hours ! He was trying so hard to impart as much of his knowledge and philosophy within that timeframe. If we had pitched tents outside his workshop, it wouldn't be much of a surprise if all downloading would continue for days. It was massively helpful and inspirational for us all. Its rare to find a watchmaker of Mr Dufour's skill and status to be so humble and so concerned about the future of classical watchmaking. 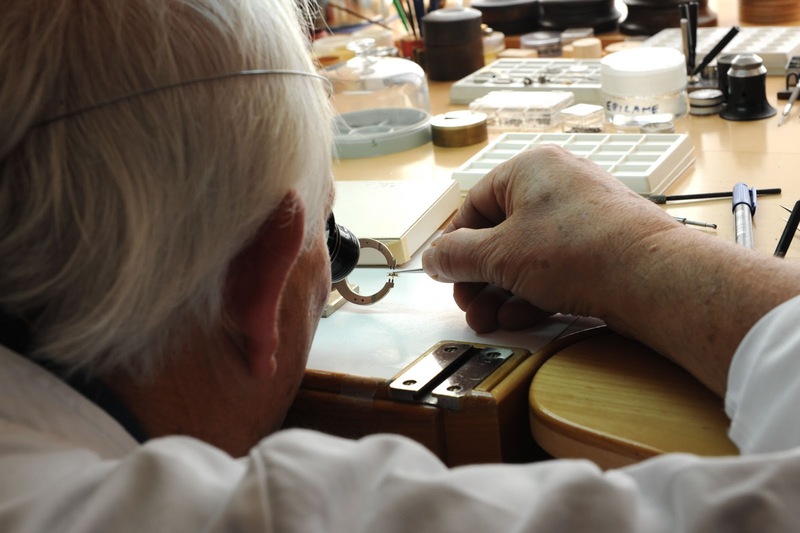 He is truly a Grandmaster of watchmaking whom passionately wants to see that the art of classical watchmaking is not lost. 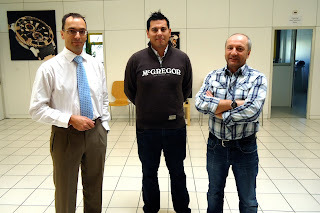 We had some visitors from Ulysse Nardin and Tag Heuer today. They are trainers who came to visit and see the school. 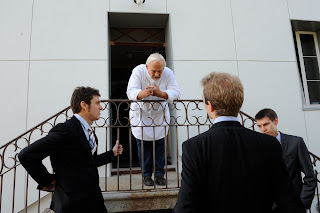 There was a lively exchange of teaching philosophies and tips on both sides. It was overall great fun for Henrik as well as he showed the visitors what the students and the school do for watchmaking. Zenith absolutely rocks. Every watch company whom wants to be a REAL watchmaking brand should follow what they do. They are absolutely the loveliest. Why ? They never paid us anything to say nice things about them and thats for sure ! But, they were really nice about a request we had sent to them via snail mail and they replied the next day !! 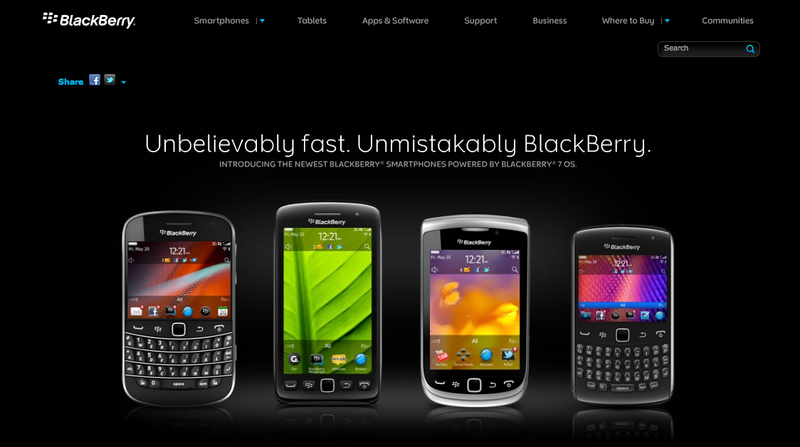 Thats lightning fast compared to some other brands whom just rejected us outright. What was the request ? We'll post pictures next week when we have it. For now, everyone including us just have to wait and see !! But they are absolutely AWESOME ! ! ! And no, we don't use these things in the school. We actually have proper toilets, both for males and females. Ya wei was one of Henrik's students in WOSTEP Neuchatel and she paid the school a visit during the Wine Fete weekend ..... Here are the pictures ! They look so mysteriously, but thats really because of the reflected light. Henrik looks almost Frankenstein-like. Who else got affected ? 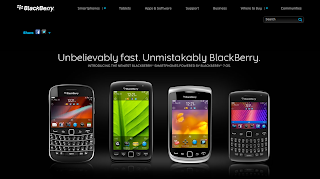 Yes, we move with the times, but the times has not moved with us because all the Blackberries in the school isn't working today nor yesterday. How very annoying !! RIM !!!! Do something quickly !!!!!! 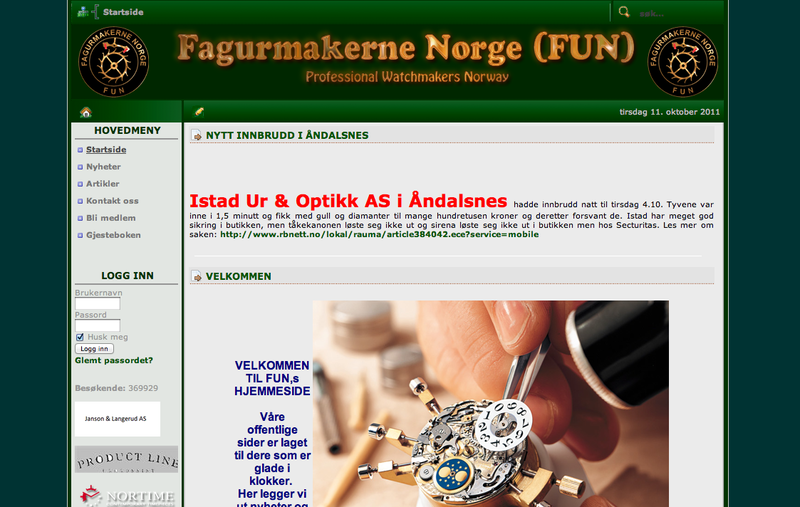 We had a special visitor from Norway 2 weekends ago and he is a very experienced watchmaker. 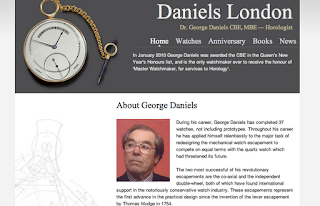 He maintains a blog which promotes watchmaking and its education. 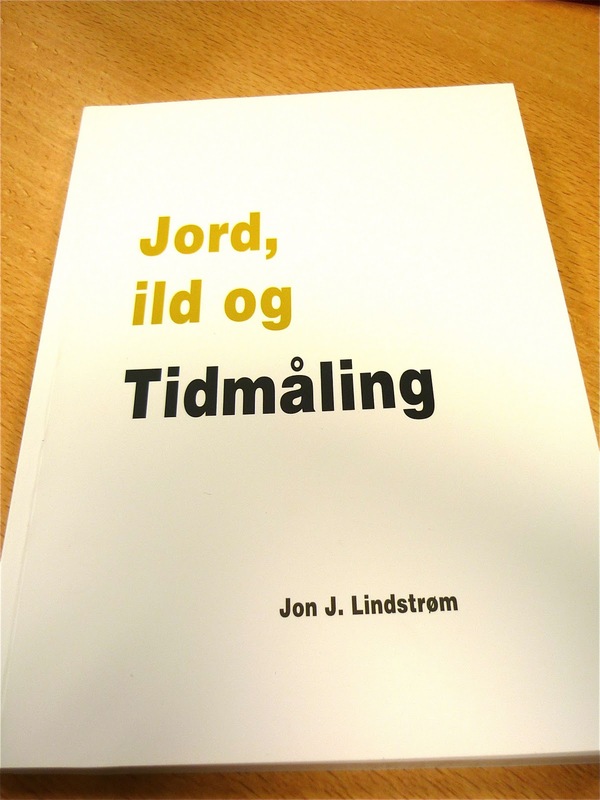 I know its in Norwegian but use Google chrome or some translation programme and snoop around. 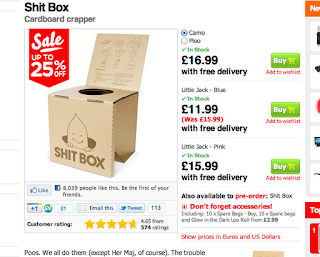 It has some interesting things ! After our post of our 6498 project on Timezone, Puristpro and other watchmaking forums, we immediately had a few inquiries !! So, this is the number tally for now. We currently have given out 2 provisional offers ( offers subject to a bench test ) and there are a few more very interested parties whom have called up the school to ask to be enrolled. Well, we really can only take 4 full skill students after April 2012. 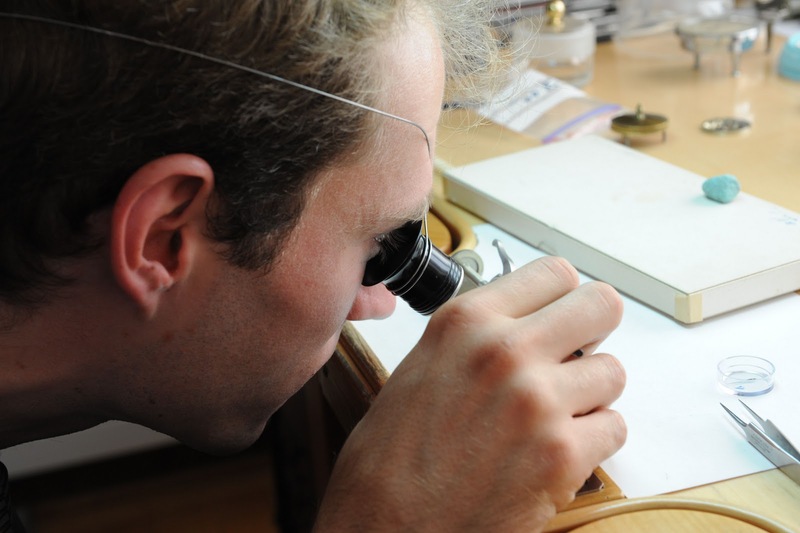 We also understand that its difficult to get entry into other watchmaking schools but do not let up or give up ! However, if we are full, please do take a look at WOSTEP schools. Some people have asked if we are competitors but we really are not ! 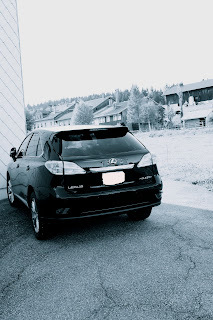 Henrik was educated in both Sweden and WOSTEP. He was also the Full training course Instructor in WOSTEP for 2007 - 2009, so how could he be an enemy to his old school ??!?? We are proud to present a revised version of the Fullskill course content. The link to download the course outline can be found here. Its currently hosted on a mediafire site but it will soon be moved to the school server. In this part of the course, the student will be constructing their own tools. The skills and knowledge gained will equip the student to be able to manufacture parts and tools for their own school piece, and more importantly, creating practical tools for their future watchmaking career. 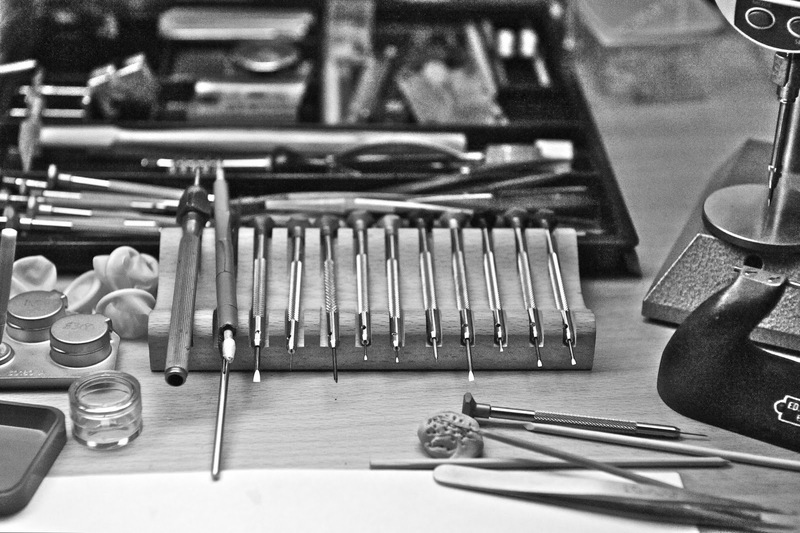 Filing: This is mainly done by hand, and different techniques will be taught. Turning: This will be taught with both smaller and bigger lathes, and also between centers. Sawing: This is mainly done by hand with a piercing saw and/or larger hand saw, in addition students will be taught how to use a machine to saw larger pieces. Thread cutting: This will be taught with the classical cutting methods. 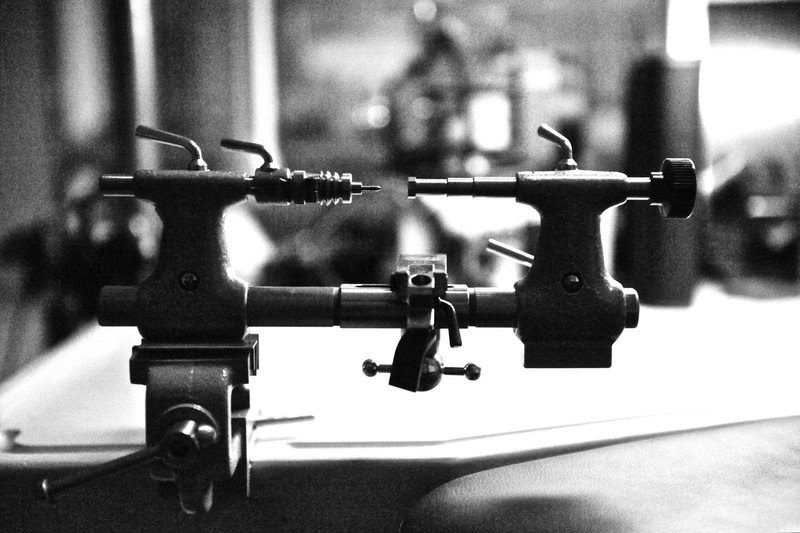 More importantly, we teach thread cutting with different techniques, such as in a drill press, milling machine and by hand. Milling: Using different techniques with different machines and various materials and cutters, we teach how to mill pinions and wheels, levers and springs and even private tools. With the help of HM and HSS metals as materials for the cutters. Drilling: Students will be taught drilling in the lathe (big and small holes), drilling with a drill press, drilling in the jig-borer and other associated drilling techniques and methods. Grinding: Students will learn grinding techniques with different grinding materials such as Arkansas, India and Diamond wheels. Heat treatment operations: Students will learn the operations by hand and by production methods, such as with the furnace. Clamping: Different techniques will be taught. For example, with stress resistant glue, vices, shellac, and magnets. Boring: Students will be taught boring using the milling machine and lathe with a boring head. Lapping: Students will know how to do lapping with different techniques and compounds such as Tetrabore and Orva. Polishing: Students will be trained in this aspect by constructing tools and polishing them by hand, machine, and with different techniques and compounds such as diamond paste and aluminum oxide. 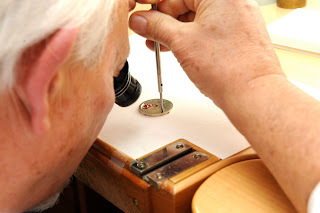 Plating: Different plating methods such as spot plating and electroplating with Rhodium, gold, palladium, black rhodium and Nickel will be taught. Sandblasting: Both manual hand methods and production methods will be taught. Decorations: Different techniques will be studied during this course. For example spotting, beveling, black polishing, circular graining, straight graining etc. 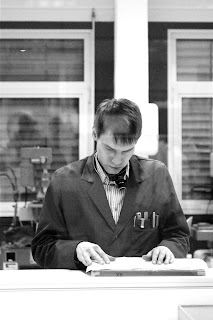 In this second part of the course, students will finalize and complete the complete fullskill training program with various exams and visits to manufactories. Also, they will be producing their own school watch. Students will have a choice of producing their own school watch from an established movement or from the school designed movement. 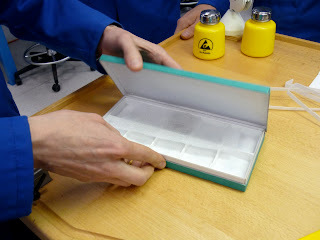 Once completed and checked by Instructors, the watch become the student’s property. The school watch is considered as a private project of the student. 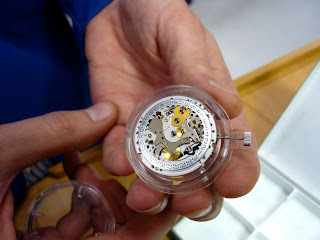 There, the student will need to buy certain parts such as the dial and cases themselves. 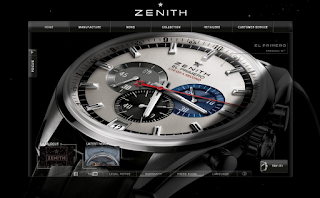 Nevertheless, it is not envisioned that the entire cost of the watch should exceed CHF 2000 in materials. 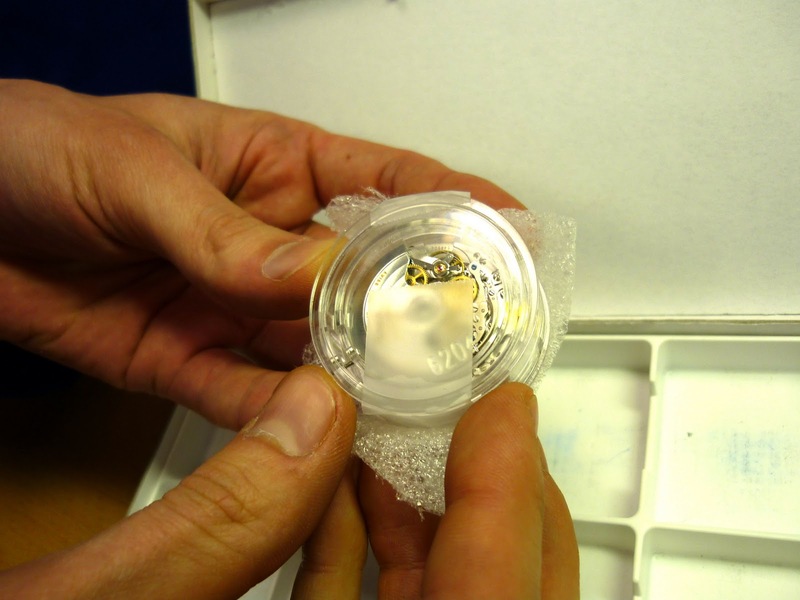 There will be numerous visits to museums, manufacturers of watches, toolmakers. 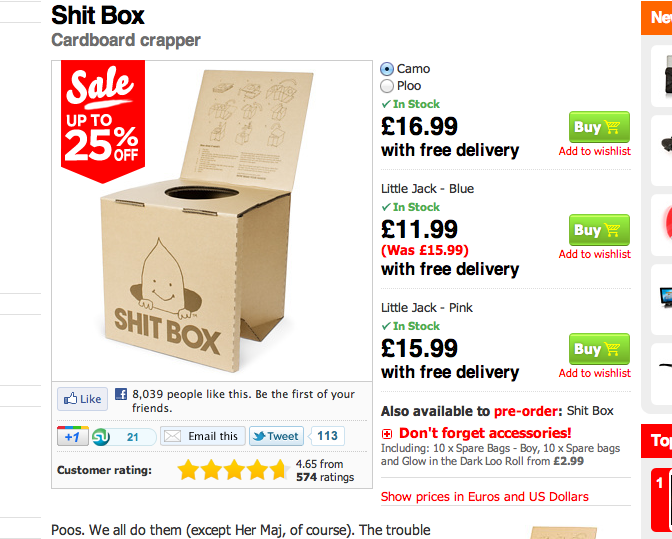 However, this will be made over the duration of the 24 months. 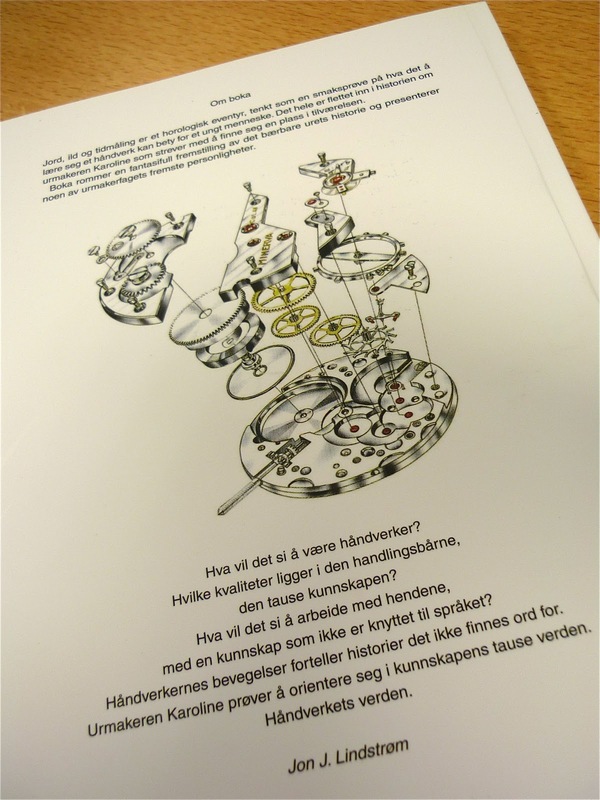 Students will be engaged in finding the correct literature about different escapements with the help of their presiding Instructor. 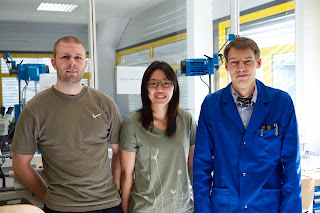 They will study the Swiss lever escapement, the Natural lift escapement, the Daniels escapement, Detent, Cylinder, Verge, and Duplex escapement in theory. 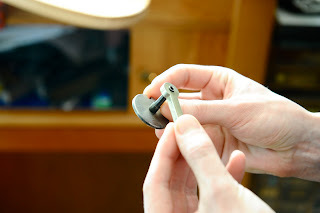 In addition, students will learn the correct functions and the adjustment of the Swiss lever escapement by the pallets and with minor interference inside the escapement (how to adjust banking pins and filing of the horns etc.). They will also learn re-shellacking. A large proportion of time will be devoted to the teaching of efficiently servicing and repairing a modern Swiss lever escapement. Students will learn how to check the divisions, end shakes and side shakes. They also learn how to remove and fit broken balance staffs and how to statically poise and true the balance wheel. In the final stages, students will learn about quality control of components, cleaning and lubrication. 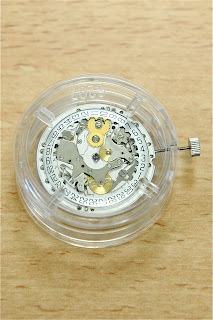 In this module, the student will learn to fit new hairsprings to watches which have damaged ones (C.G.S. system). Not only will students learn the fitting of new hairsprings in serial, they will also be engaged in calculations for a new hairspring replacement with the 2nd pinning point. Students will then be expected to be able to vibrate it to the correct frequency with precise adjustments to the trueness and flatness at the collet and under the balance bridge, including studding up. 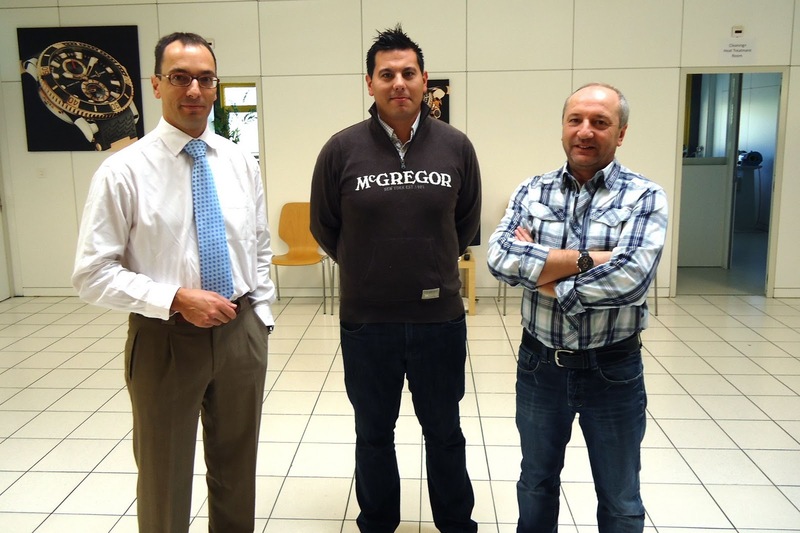 They will also learn how to make Breguet overcoil hairsprings in blue steel and/or Nivarox material. Coefficient of thermal expansion of different materials such as Steel, silicium and silicium oxide will be studied. If the student finds the time and the right motivation, he/she will also be able to learn the Grossmann internal terminal curve. The culmination of the knowledge will lead up to the student being able to rapidly and efficiently make corrections to hairsprings in an After-sales service environment. 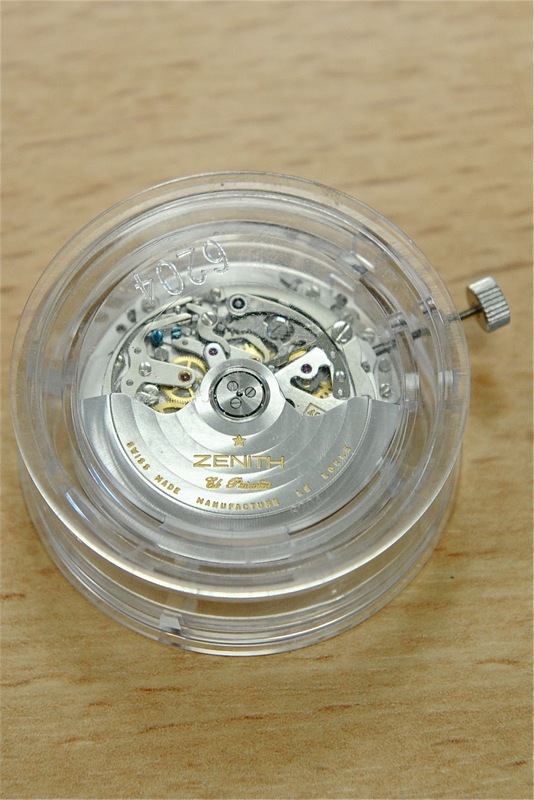 For this module, the students will learn the proper way of timing a watch. They will learn how to dynamically poise and adjust rates in different positions and also different timing procedures and controls like the CTM system. They will also be taught how the Swiss rating institute C.O.S.C. controls movements. It is an outcome of the course that the student will be able to service any simple calendar or self-winding watch. In addition, they will be taught the theory behind perpetual calendars. 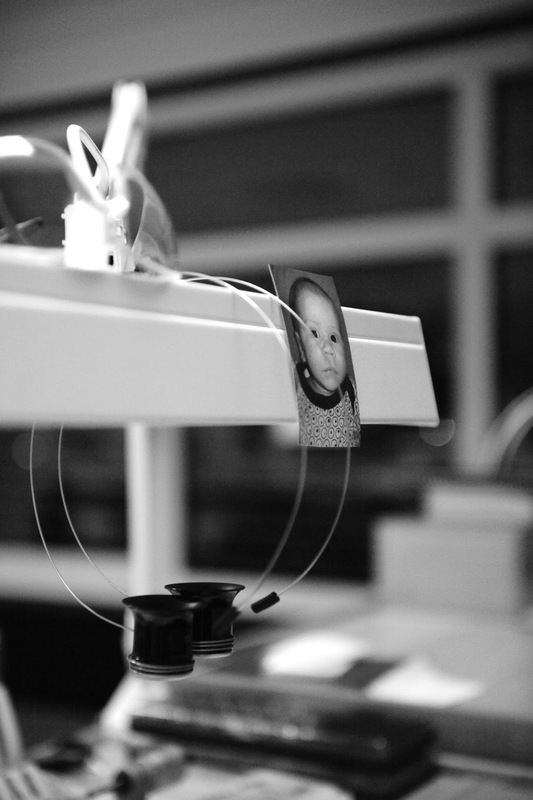 Students will learn how to measure any electronic watch. They will also be taught how to troubleshoot, analyze the measurement data and servicing. It is envisioned that students will be trained inside any Swiss watchmaking factory where they will be performing encasing for about 4 weeks. 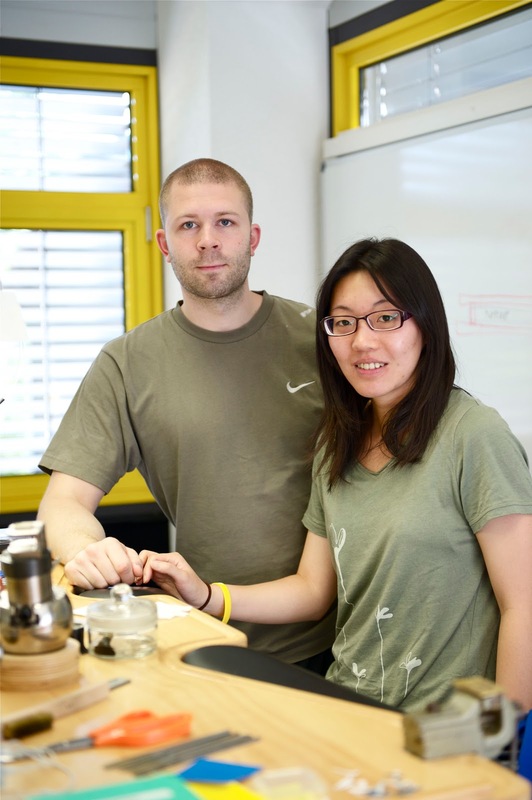 They will learn to work with new products and materials, increase their speed and quality of working as well as getting their first encounter with the Swiss watchmaking industry. This is a specialized module based on school work and practical experience. 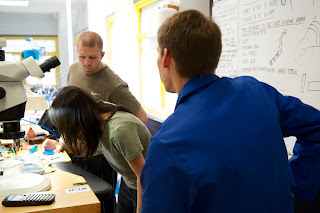 Students will be taught the processes of precise control and measurements in the quality control department with optical instruments as well as with physical measurements techniques. Students will be studying different chronograph systems, such as the classical column wheel system, cam system, modular systems, horizontal and vertical clutch systems with or without automatic device. Plans have been made to introduce students to Quick/Rapid prototyping and quick modeling techniques. Depending on availability of external teachers, optional courses may be made available. These include subjects such as Enameling, stone setting or engraving. A special module in basic Macro photography has been designed and created by a professional photographer. Students will learn the basics of camera operation and economical methods of achieving near-publishing grade photos for self promotion or for customers. This module aims to equip students with basic knowledge of marketing and consumer behavior. Students will learn various methods of online marketing with different mediums of social media such as blogs, website creation, online advertising and social media platforms. Some basic legal principles will also be taught with regards to basic contract , consumer and Intellectual Property law. 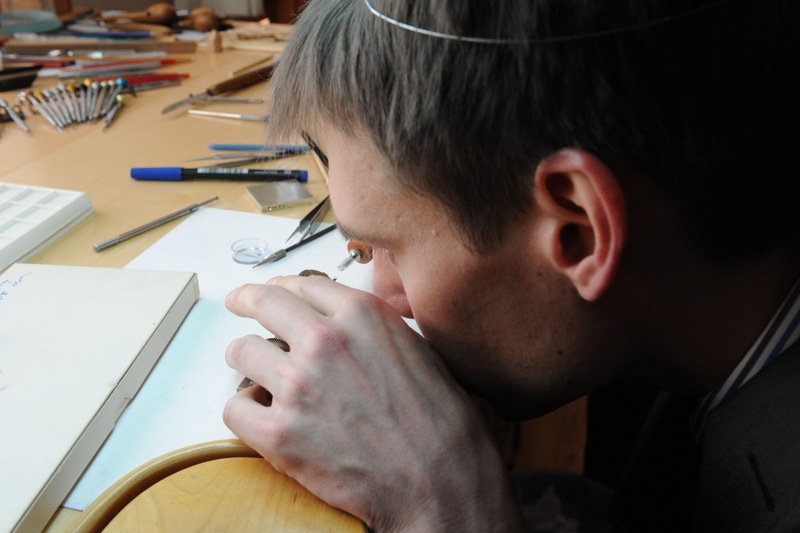 It is envisioned that the students who have enrolled in the Fullskill course aims to become Independent Watchmakers after graduation. Therefore, it is necessary that they are empowered with not only watchmaking skills, but also skills to promote and sell their products. 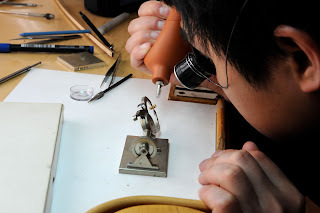 The students may have the possibility to repair watches for real customers in the school for the factory or for collectors. Furthermore, depending on time constrains, students may undertake repair work for family and friends if he or she is motivated enough.